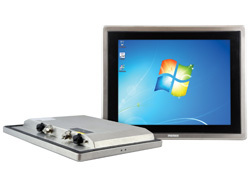 Certified for Hazardous Areas, the rugged RC6700 Industrial Panel PC comes with a 15”(4:3) touch screen display, powered by Intel® Atom™ N2600 1.6 GHz Processors. Intrinsically safe and explosion proof, the RC6700 is built for harsh environmental and complies with certification requirements for Oil, Gas, and oilfield equipment & services applications. The fanless low maintenance panel PC is constructed with completely sealed stainless steel type 4/4X, IP 65/66, NEMA 4/4X enclosure with environmental ratings including Class I/Division 2, ATEX, CE and IEC. The industrial-grade high-bright LCD 15” (4:3) flat screen panel employs the analog resistive 5-wire touch screen technology enabling flawless operation even with gloves on.